Jason Coffman didn't plan out what he was going to say when he spoke Tuesday night at a vigil for his son Cody, who was killed last week when a shooter opened fire in the Borderline Bar in Thousand Oaks. But the 12 red roses the mourning father clutched in his hand filled the spaces where words failed to express his grief and the compassion for those who shared his agony. 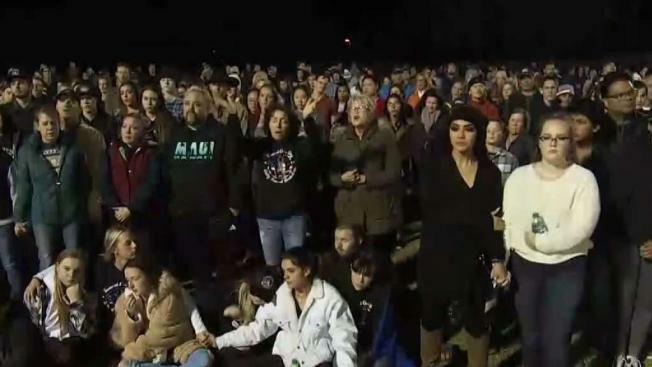 After saying a few words between sobs to the more than 1,000 people who gathered on a chilly and windy night in Newbury Park, Coffman handed a rose to each family of the 12 victims in last Wednesday's mass shooting. "I have 12 roses, and I would absolutely be honored to meet the families, right now, one by one," Coffman said. Wearing his blue Dodgers hat and a hooded sweatshirt, Coffman then handed each family a rose and shared tearful embraces and memories of those they had lost. The size of the crowd, many bundled in jackets, touched friends and family. The gathering was at a park where 22-year-old Cody Coffman umpired for little league baseball teams. "When he was here, he didn't think he had an impact on anybody," said friend Brandon Garza. "He thought he was just an average guy. Look at what he did. He brought all these people together." Like many of the shooting victims, Cody Coffman had been making plans for what he wanted to do with his life. He was talking with Army recruiters and preparing to fulfill his dream of serving his country, his father said. He loved his three brothers, ages 6 to 9, and was eager for the birth of a baby sister -- due Nov. 29. Before his son left for the Borderline Bar last Wednesday night, Coffman told him not to drink and drive, and that he loved him. Hours later, he was at a family unification center waiting in depseration to hear whether his son had made it out of the Thousand Oaks bar. He then shared the horrible news with those gathered outside the unification center that his son was among those killed. A memorial service was held for Cody Coffman Wednesday at Perez Family Chapel in Camarillo.